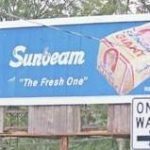 Local residents have recently noticed something different about the historic “Sunbeam girl” that has swung on a billboard at Harding and Main Street for many decades. She was missing, which resulted in people throughout the community asking questions or speculating where she might be. There have even been a few individuals on Facebook who have created their own Sunbeam girls to take the place of the one missing. The truth of the matter is that the swinging girl has been taken in for repairs, according to a representative from Flowers Baking Company, which owns the sign. The representative said the swinging girl will return to her newly-refurbished billboard sometime in early 2019. The billboard will also feature a light so that she can be seen at night, the representative said.